The book, which portrays Jesus as an angry rebel, has propelled Reza Aslan into a life as an Internet-era public intellectual who has a movie deal and is a social media regular. Reza Aslan began 2013 as an academic teaching creative writing at UC Riverside. In the summer, he published the book “Zealot: The Life and Times of Jesus of Nazareth” and everything changed. Now Aslan is ending his wild year with a movie deal for “Zealot” as well as writing a pilot for cable TV network FX, running the “transmedia” company Boomgen Studios, working on a novel — and trying to craft the next episode in his unorthodox life as an Internet-era public intellectual. Buzzfeed posted a video of the awkward encounter with the headline, “Is This the Most Embarrassing Interview Fox News Has Ever Done?” The clip quickly shot across the Internet. As one of the country’s most prominent Muslim thinkers, the 41-year-old Aslan is often invited to publicly talk about religion, politics and cultural identity. But his ambitions go far beyond the ivory tower. Aslan lives in Hollywood, in a 1,500-square-foot cottage with hardwood floors in the shadow of the Magic Castle. He shares his home with his wife, Jessica Jackley, an Internet crowd-funding pioneer, and their twin toddler boys. “No hair pulling!” Aslan tells one of the boys as they grapple each other in the homey living room. When Aslan was 7, his parents fled Iran in the wake of the Islamic revolution, settling the family in San Jose. In the U.S., the Iranian hostage crisis made all things and people Iranian vastly unpopular. Aslan, with his foreign sounding name and umber complexion, had a hard time. At 15, he was invited to a summer camp hosted by the evangelical Christian group Young Life and converted to Christianity. “I burned with the fire of God,” he says. He even managed to convert his mother. When he arrived at Santa Clara University in 1992, he chose to study the life of Jesus. “He was not just smart, there was a great entrepreneurial spirit in him,” says Father Paul G. Crowley, a professor at Santa Clara, remembering Aslan’s days as an undergraduate at the Jesuit college. Aslan had an epiphany, however, when presented with a basic fact of biblical scholarship: When Jesus called himself the Messiah, he had a specific Jewish idea in mind. In Jewish thought, he could never be a divine being. He earned a master’s degree in theological studies at the Harvard Divinity School, but he felt he didn’t quite fit in there, ending up next at the prestigious Writers’ Workshop at the University of Iowa. When the novel he wrote there didn’t sell, he proposed to his agent a work that explained Muhammad to American readers. That book became “No god But God: The Origins, Evolution, and Future of Islam.” It made him a fixture on cable talk shows, asked often to comment on events in the post-9/11 Muslim world. Aslan went on to get his doctorate at UC Santa Barbara’s interdisciplinary program in religious studies, earning a degree in sociology. He arrived at his seminars “ready for a fight” and “with knives sharpened” while discussing other scholars and their work, a professor there remembers. His dissertation applied notions of “social movement theory,” which seeks to explain how people arrive at collective actions, to the jihadist movements in the Muslim world, says his adviser, Mark Juergensmeyer. Aslan freely admits the book popularizes scholarship that goes back to Albert Schweitzer and John P. Meier, who wrote “A Marginal Jew.” At UC Riverside, where Aslan teaches creative writing, his work was seen as weighty enough that the religious studies department has considered inviting him to become part of their faculty. But he doesn’t always behave like an earnest academic. A social media regular with more than 50,000 followers, Aslan has engaged in some pretty impolite conversation online. After the Fox News dustup, Buzzfeed posted a series of earlier Twitter messages in which Aslan sounded like a guy picking a fight in a bar. “Guess your assumption makes (a jerk) out of U,” Aslan wrote in January, in response to a tweet. “You don’t know … about me,” he wrote to another. “When you’re confronted with Islamophobes and trolls … your proper response is to tell them to go … themselves,” he says, sitting in a library lined with many books, including foreign translations of his own works. Being in the spotlight has its downside, though. Aslan doesn’t like the personal attacks on his interfaith marriage. (His wife is Christian). Fame has also brought a dispute with an ex-fiancee, writer Amanda Fortini, into the open after Aslan launched a civil suit against her in Los Angeles Superior Court. During their relationship, Aslan signed a “quitclaim” deed granting Fortini partial ownership of the Hollywood home he had purchased in 2007. The suit says he did so “under great emotional distress and pressure” and seeks to have Fortini’s claim nullified. When Fortini countersued, a story about the dispute appeared online at the Atlantic — complete with a picture of the house. Aslan said that’s when he knew he’d entered a new realm of celebrity. Fortini would not comment for this story, but her attorney, Jonathan Levitan, said she feels she has “contributed” to his current success and that Aslan had “taken advantage of her” in their business dealings. Aslan hasn’t let any of the controversy slow him down — in fact, he seems to feed on it. This fall, he made an appearance on the new reality show “Raising McCain” alongside his wife and brother-in-law. Aslan says he is writing a novel set in the Middle East circa 1000 AD; working on the pilot for “Tyrant,” an FX series about Americans in the Middle East created by the team behind “Homeland”; and writing and producing assorted movies. 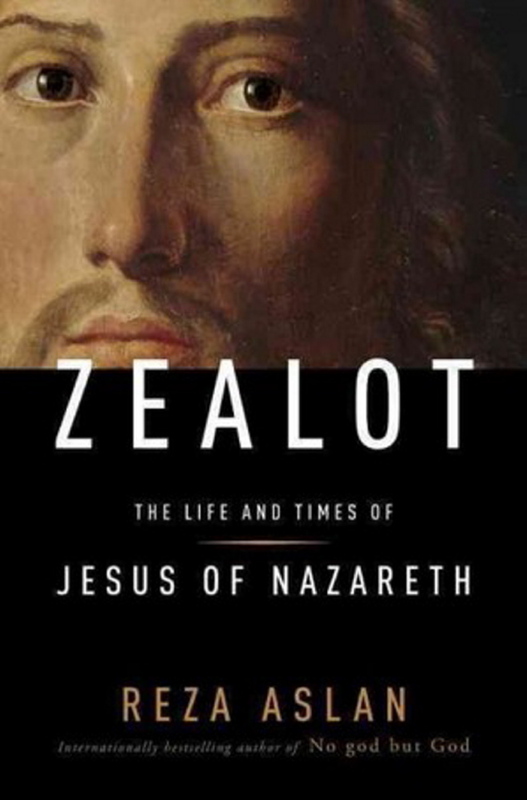 Meanwhile, “Zealot” — a book whose popularity is fed by a portrayal of Jesus as angry, idealistic and recognizably human — stayed on the Los Angeles Times’ bestseller list into late December, after 16 weeks on the list.